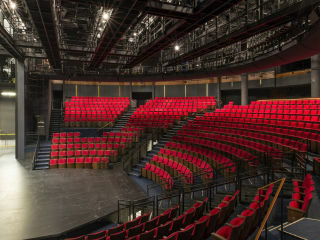 The Alley Theatre is hosting a free, public open house so visitors can get a sneak peek of the Alley’s $46.5 million renovation. Mayor Annise D. Parker along with cultural and civic leaders will participate in a ceremonial ribbon cutting celebration prior to guided tours. This is the first extensive renovation of the Alley’s facilities since its opening in 1968 and includes major improvements in the Hubbard Theatre, backstage area, and public spaces. The public will get a “first look” of the newly-renovated theatre prior to the first performance of the inaugural season, One Man, Two Guvnors, on October 2.